Margaritas are the quintessential summer cocktail, but that doesn't mean you can only enjoy them in the summer time! 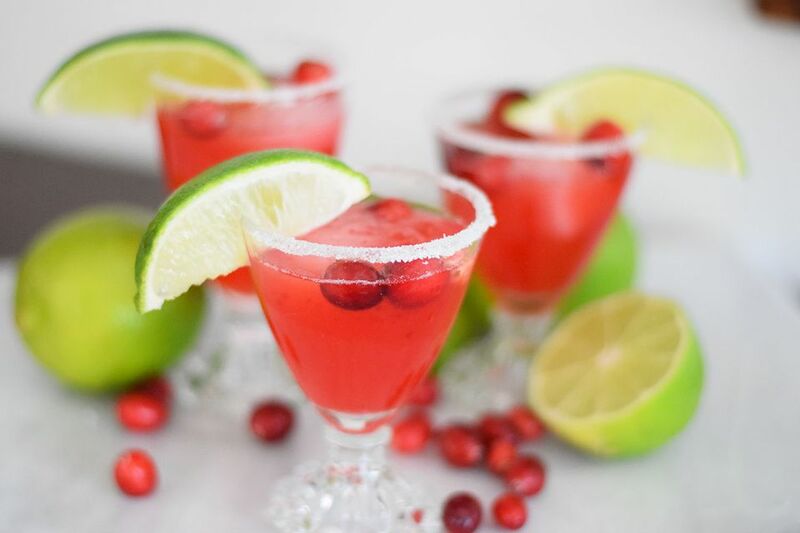 Add some deliciously tart cranberry juice and you've got a beautiful and festive margarita that is perfect for the winter season. These margaritas are easy to make in large batches. They can easily serve a large crowd and are sure to please. You can also make them single serve. Just stick to one ounce of tequila, 1/2 an ounce of triple sec, top with lime juice and splash of cranberry juice. Whip up your own cranberry juice for extra flavor and color—it's not that difficult to make, but takes a little bit of extra time as you have to allow the juice to cool. If you aren't up for making the juice from scratch, you can replace the homemade juice with about 1 1/2 cups of store-bought cranberry juice. The cocktail will still be delicious and beautiful. You can also make this cocktail a virgin one. Simply replace the booze and lime juice with some fresh margarita mix or lime juice and simple syrup. It's almost as good as the real thing and is perfect for kids or those who are expecting during the holidays. Add the fresh cranberries to a small saucepan. Turn on the heat and add the granulated sugar and water. Stir to combine and allow to come to a boil. Once the cranberries are soft (about 5 to10 minutes), turn off the heat. Let cool to lukewarm. Strain the cranberries over a fine mesh sieve. Allow the cranberry mixture to completely cool before making the cocktails. To make the drinks, shake or stir together the cranberry juice, lime juice, tequila, and orange liquor in a cocktail shaker filled with ice. Salt or sugar the rim of the glasses. Add ice to each glass and strain the cocktail over the top of the ice. Garnish with fresh cranberries and lime wedges.